In one week we will gather lots of family and friends for a wedding. Every minute of each day is filled with preparations. Some of the very flowers growing here around the garden will be used at the event. I can’t wait to share it with all of my garden friends here on Down To Earth Digs. Can’t wait to see! Enjoy the day! Stacey, I know how crazy hectic these final days can be before the wedding. Do remember to savor every moment, though. So happy for your daughter. I sure hope you have lots of photo’s. Your vignettes and garden accoutrement must have made for great photo opportunities. 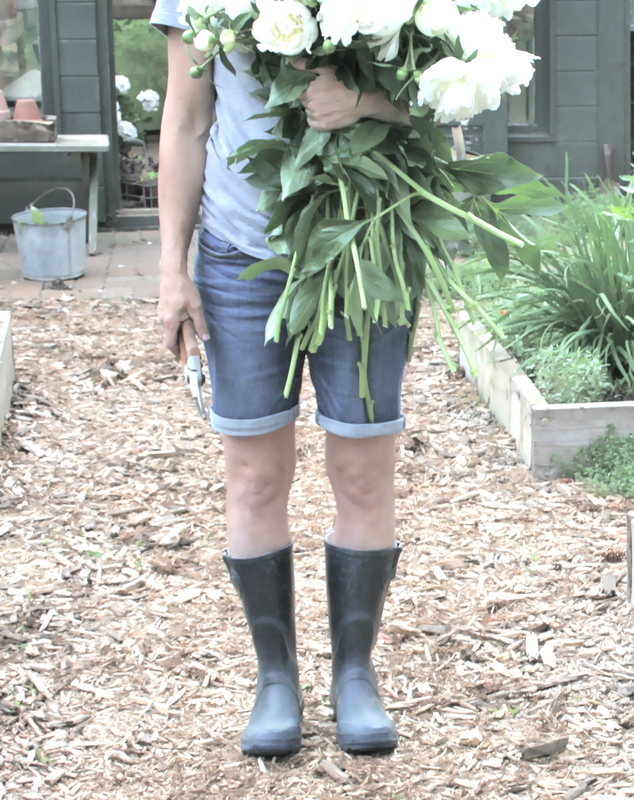 BTW, you’ve made rubber boots look swanky with an arm full of Peonies. What’s that one called? I’d love a white one but never see them here.